Just human enough to play the part of a therapist, Ellie resides in the computer of the University of Southern California’s (USC) Institute for Creative Technologies. Her actions, motions, and speech mimic that of a real therapist, but not to the point that she seems completely real. But that is exactly the reason why Ellie is so successful. As technology grew alongside medicine, it became somewhat of a two-edged sword in the field of psychology. In order to provide the best possible care for their patients, health care professionals need accurate and thorough information from their patients. However, studies have shown that patients that have their information recorded digitally as opposed to on paper are more hesitant to reveal personal details about themselves. People are skeptical as to where the information will end up, and are more likely to clarify the privacy of their information. Ellie seems to work in the exact opposite way. Patients admit that they feel less judged by the virtual therapist and more open to her, especially if they were told that she was operated automatically rather than by a remote person. Despite knowing that their information will be headed the same way, patients have no hesitation in confiding in this masterpiece of an AI. “It’s about what’s happening in the moment – having a safe place to talk,” says Gale Lucas, a social psychologist at the institute. USC researchers created Ellie as part of a virtual-reality program called SimSensei using funding from the Defense Advanced Research Projects Agency (DARPA), aiming to treat people with depression and veterans with post-traumatic stress disorder (PTSD). She was borne in an attempt to have patients be more truthful in their answers. In a 2009 national opinion survey by GE, 28% of patients admitted to lying or omitting facts about themselves to health care professionals. Ellie functions through a computer program that uses different algorithms to determine her questions and motions. A webcam and microphone allow her to observe the patient and give her feedback on when to ask certain questions, when to nod, and how to analyze the emotional cues. The program observes 66 points on the patient’s face to read their current facial expression and the variation in expressions throughout the session, taking note of a “flat” expression that is symptomatic of depression. She also looks at the patient’s rate of speech, and records how long they pause before answering a question. 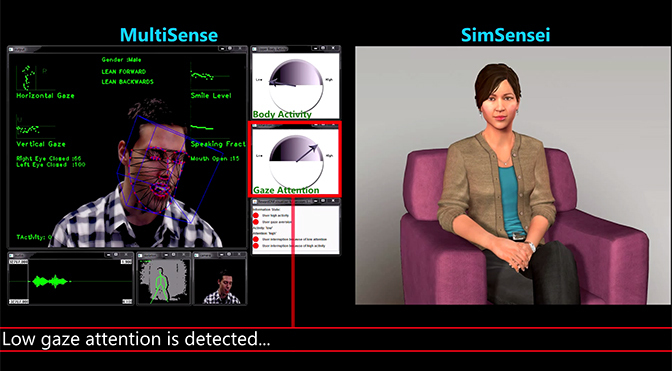 A Kinect sensor furthermore allows her to look at body posture, head nods, eye shifts, and other visual cues. Despite her accomplishments as a miracle worker who never has a bad day, Ellie admits early on in the session that she is “not a therapist”, but is there to listen. She cannot respond to questions, so “if someone says something terrible, we want them to understand why she isn’t asking them more about it,” says Glota Stratou, a research programmer at the institute. Ellie has only been used in research settings thus far, although she’s interacted with over 600 subjects. The next step for the research team is to expand her range of capabilities. They plan to have her interview cancer patients about difficulties they have with their illnesses and treatments and consult veterans about their sexual trauma. As technology improves, they also hope to implement Ellie on laptops and other portable devices, allowing Ellie’s comfort to reach even the most remote locations. Do Mice Dream of The Future?